Capriccio, Op. 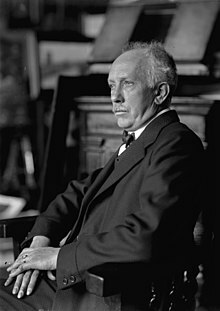 85, is the final opera by German composer Richard Strauss, subtitled "A Conversation Piece for Music". The opera received its premiere performance at the Nationaltheater München on 28 October 1942. Clemens Krauss and Strauss wrote the German libretto. However, the genesis of the libretto came from Stefan Zweig in the 1930s, and Joseph Gregor further developed the idea several years later. Strauss then took on the libretto, but finally recruited Krauss as his collaborator on the opera. Most of the final libretto is by Krauss. The opera originally consisted of a single act lasting close to two and a half hours. This, in combination with the work's conversational tone and emphasis on text, has prevented the opera from achieving great popularity. However, at Hamburg in 1957, Rudolf Hartmann, who had directed the opera at its premiere in Munich, inserted an interval at the point when the Countess orders chocolate, and other directors have often followed suit, including performances at Glyndebourne Festival Opera. The final scene for Countess Madeleine can often be heard as an excerpt. Capriccio received its American professional premiere at The Santa Fe Opera in 1958 after the Juilliard School staged it in 1954 with Gloria Davy and Thomas Stewart as the aristocratic siblings. The theme of the opera can be summarized as "Which is the greater art, poetry or music?". This was a topic of discussion at the time of the setting, as in an opera named for the issue, Prima la musica e poi le parole (First the Music and Then the Words) (Salieri, 1786). This question is dramatized in the story of a Countess torn between two suitors: Olivier, a poet, and Flamand, a composer. At the Countess Madeleine's château, a rehearsal of Flamand's newly composed sextet is in progress. (This sextet is in reality a very fine composition for string sextet and is played in concert form as a piece of chamber music, independent of the opera.) Olivier and Flamand debate the relative powers of words and music. They engage in a rather furious argument which is semi-spoken rather than sung in definable arias. The theatre director La Roche wakes from a nap, and reminds them both that impresarios and actors are necessary to bring their work to life. Olivier has written a new play for the Countess's birthday the next day, which will be directed by La Roche, with the Count and the famous actress Clairon performing. La Roche, Olivier and Flamand proceed to a rehearsal. The Count, the Countess's brother, teases his sister about her two suitors, Flamand and Olivier, and tells her that her love of music is due in part to the attentions that Flamand pays her. In turn, she tells her brother that his love of words is in keeping with his attraction to the actress Clairon. The Countess admits that she cannot decide which of her suitors she prefers. Clairon arrives, and she and the Count read a scene from Olivier's play, which culminates in a love sonnet. They leave to join La Roche at the rehearsal. Olivier tells the Countess that he means the sonnet for her. Flamand then sets the sonnet to music, while Olivier declares his love for the Countess. Flamand sings them his new composition, accompanying himself on the harpsichord. Olivier feels that Flamand has ruined his poem, while the Countess marvels at the magic synthesis of words and music. Olivier is asked to make cuts to his play and leaves for La Roche's rehearsal. Flamand declares his love for the Countess and poses the question – which does she prefer, poetry or music? She asks him to meet her in the library the next morning at 11, when she will give him her decision. She orders chocolate in the drawing-room. [At this point, some directors bring down the curtain and there is an interval.] The actors and La Roche return from their rehearsal and the Count declares that he is bewitched by Clairon. Madeleine tells him of her reluctance to choose between her two suitors, and the brother and sister gently tease each other again. Refreshments are served as dancers and two Italian singers entertain the guests. The Count, Countess, Flamand, Olivier, Clairon and La Roche reflect on the respective merits of dance, music and poetry. The discussion is lively, even aggressive on the part of the men. The Count declares that "opera is an absurd thing". La Roche describes his planned two-part birthday entertainment for the Countess, the "Birth of Pallas Athene" followed by the "Fall of Carthage". The guests laugh and mock his extravagant ideas, but La Roche, in a monologue of the merits, attacks what he sees as the weakness of these contemporary youngsters, whose creations fail to reach the heart; he defends his faith in the theatre of the past and his own work as a mature director and a preserver of the great traditions of the arts. He challenges Flamand and Olivier to create new masterworks that will reveal real people in all their complexity. The Countess manages to reconcile the three, urging them to make peace, pointing out how their arts are interdependent; she commissions the pair to collaborate on an opera. They search for a plot and it is the Count, "who doesn't care much for music, he prefers military marches" teases his sister, who hits on the bold idea of an opera which depicts the very events of that afternoon, the characters to be real people "like us", just as La Roche wishes – the ending to be decided by the Countess. The Count and Clairon depart for Paris with the theatre company. In a witty touch, the next scene consists of the servants commenting, as they clean up the room after the guests have all left, on how absurd it would be to portray servants in an opera. "Soon everyone will be an actor," they sing. They deride their employers for 'playing' at the theatre and discuss who the Countess might be in love with. The Major-Domo discovers the prompter, Monsieur Taupe, who has fallen asleep and has been left behind. In a scene of much humour, Monsieur Taupe explains that it is actually he who is the most important person in the theatre – without him, there would be no entertainment. The Major-Domo listens patiently and then arranges for food and his transport home. As evening falls, the Countess returns, having dressed for supper, and learns from the Major-Domo that her brother has gone to Paris with Clairon, leaving her to dine alone. The Major-Domo reminds her that both Olivier and Flamand will meet her in the library in the morning to learn the ending of the opera. Alone, and still undecided as to both the ending of the opera and her choice of lover, she sings of the inseparability of words and music. In like manner she tells herself that if she chooses one she will win him but lose the other. She consults her image in the mirror, asking "Is there any ending that isn't trivial?" The Major-Domo announces that "Dinner is served" and the Countess slowly leaves the room. The opera is a light-hearted treatment of a serious subject: the relative importance of music, poetry, dance and theatre, cleverly set as an opera within an opera. ^ Anderson, David E. (March 1992). "Review of '"Fürs Wort brauche ich Hilfe: Die Geburt der Oper Capriccio von Richard Strauss und Clemens Krauss" by Kurt Wilhelm". Notes (Second Series). 48 (3): 876–879. JSTOR 941709. This page was last edited on 31 March 2019, at 23:44 (UTC).